Want to play BioBeasts? Signup for the Beta today! Beta invites will be issued in the order they’re submitted so don’t delay! Once your turn comes, you will receive an invite be one of the growing population of our Beta players! Careful, though! There will be bugs, but you'll have the opportunity to help us squash them! EpicDuel is a game primarily focused on PvP battles and like most PvP games, the playerbase can be very passionate. This passion sometimes causes players to treat each other in a disrespectful manner. It's important to always remember that behind each player character is a real live human, just like you. With that said, I'd like to present this note from Battle Elf and Therril, who help us maintain order on the AE Forums. It seems there's been some confusion with the authority and responsibilities of members of the Guest Staff on the Forums. First of all, the members of the Guest team currently have a title on the Forums to indicate that they are indeed a verified member of the team. If you have any concerns of questions about who is part of the team, please PM any ED AK, Forum Moderator, or Forum Admin. The Forums are a place to create a community. While we all love when the members of the ED staff comment and chime in on the forums, they are in no means REQUIRED to do so. It's our privilege that they join us here. The Guest team members are staff members. They have the authority to comment on behalf of the developers and deserve to treated with respect. No matter how frustrated or upset you are about EpicDuel's development, harassment of the staff is not acceptable. Such flaming will result in disciplinary action as well as discourage the team from using the forums. We understand that EpicDuel has a passionate and opinionated community. However, please make sure you express yourself in an appropriate and respectful manner. We will be doing a very small update this week to fix some bugs and implement the Ultra OmniKnight Blade in EpicDuel. 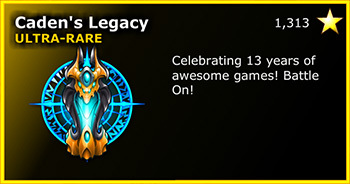 You will be able to simply turn-in Caden's DNA through a new Caden's Legacy mission for the rare anniversary sword. The sister Blade will be made available through a prize code! As many of you have noted, the Central Station War has been put on hold for a very long time. This is due to a number of reasons that we have not communicated yet. First, the War 2.0 system was designed to rely heavily on automation -- it would activate and disable with only minor involvement from the developers, allowing us to focus on other aspects of the game. The problem is, with Centra Station, we have reached the final region for the War. Ideally, when the Central Station War ends, the Dread Plains will be next in the queue, but since this has never actually happened, it has never been truly tested. Completing this system will take quite a bit development time, both to create a buffer of content for prizes and to wrap up the code to guarantee the system will function. Second, if we released the Central Station War prematurely, we'd just be kicking the work further down the road, which would in turn delay each additional war in the new cycle. Before we release the next war region, the system should be complete. It's also true that BioBeasts has taken a lot of development time from EpicDuel features like the War 2.0 system and Legendary balance which I will discuss below in my next point. Some have been critical of the development time spent on BioBeasts. 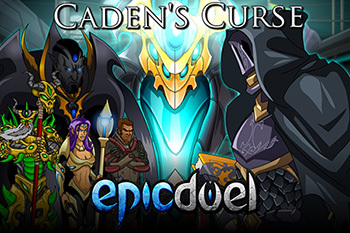 Why not EpicDuel 2? Why not port EpicDuel to mobile? Many of these questions were answered in the BioBeasts' FAQ, but I will reiterate here: BioBeasts offers the best chance for EpicDuel's survival. Flash is dying due to forces beyond our control. It may have been to our benefit to start mobile development much sooner, but the decision to divert time away from EpicDuel, even in a small way, was extremely difficult. Now, we're in a situation as a team and as a company that we NEED to move to platforms other than Flash. AQ3D, Undead Assault, and BioBeasts aren't cute side-projects or experiments -- they're the future of Artix Entertainment and thus critical to the survival of the legacy games. We would love to do more releases in EpicDuel, but we're currently maxed out for time, even with our amazing Guest Team. Every release takes time to create content, add database, entries, market, and test. 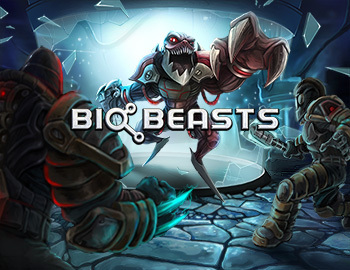 More EpicDuel releases means BioBeasts takes a hit and gets delayed further. It's a brutal cycle and we're all working dangerously hard to maintain our current rate of productivity. 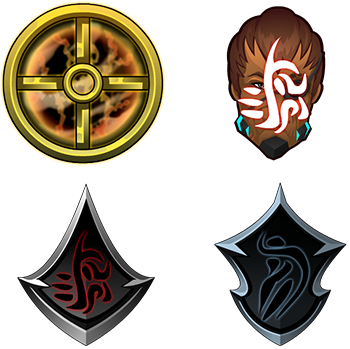 I've personally spent a few nights at the lab to finish EpicDuel updates to not detract from BioBeasts development time (I know, I'm sure my medal is in the mail as we speak). "Ok, so when is BioBeasts coming out if it's so important?" Very soon! That's unfortunately still very vague, but each week our beta testers get another huge batch of updates and improvements, ensuring a stable, fun, and fast final build of the game! In order to hit our schedule, we need to focus as much as possible. That means we need your patience during this grueling time. "So when BioBeasts is done, does that mean you'll go back to EpicDuel full time?" This depends on a lot of unknowable factors: Are there critical bugs? Does the game need more content? Is the game fun enough to keep people playing? Is it being marketed well enough? If everything is 100% perfect (which it never is), we will have more freedom to attack many lingering issues in EpicDuel. 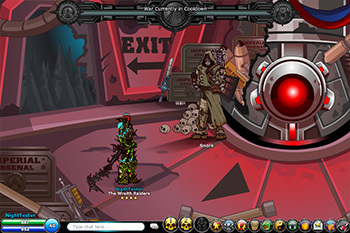 Realistically, there will be bugs to squash and content to add, but when we're no longer under the weight of a crunch, our schedules will open up for more EpicDuel development. 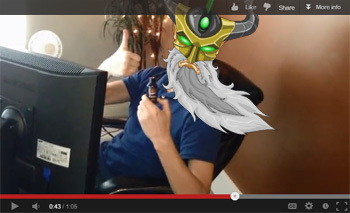 "So after BioBeasts is done, you're working on a new ED full-time?" That's very hard to say. We'd love to see ED on mobile devices, and we've learned a tremendous amount from developing BioBeasts but a mobile ED would be a huge endeavor. Right now, we're focused on releasing BioBeasts and maintaining EpicDuel. When the time comes we'll need your help promoting BioBeasts in as many venues as possible. 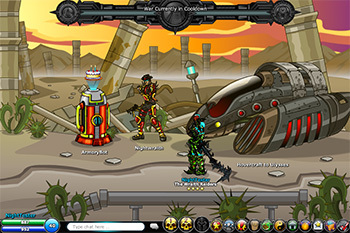 The AE network is well interconnected, so more BioBeasts players could become new EpicDuel players. This is not a guarantee, but we've seen through past game releases that nothing, not even the biggest phases releases, bring in more traffic than a new game. 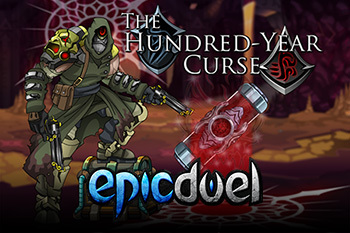 In the meantime, we still have release content coming up for EpicDuel, including a showcase for Guest Artist Hatred Cuirass. Our artists are also working dilligently on honing their skills for war prizes and seasonal content for this year's Frysteland event. For those of you looking forward to another Frozen Fury gifting event...you're in luck! We'll be reactiving the gifting module for another month of gift-giving! New vehicles, new weapons, and new upgradeable achievements will be available for all who decide to spend their holidays on Delta V! Last year, we awarded the most generous player with Titan's Alpha Gear! What will we reward this year to top it? Again, this is a super-stressful time for everyone so we ask for your patience as we try to make BioBeasts the best and most successful mobile game AE has ever released. If we truly had demi-god powers, we would duplicate ourselves and build ED AND BioBeasts AND ED2 3D VR EX: Championship edition, but alas, we are finite beings. Rest assured that we are working many, many hours to deliver on BioBeasts and create something that will provide hundreds of hours of enjoyment! Please be patient with us as GOOD things are coming. Very good things! As Charfade says, "Let's get better together!" There's something extra-wrong with Snork lately. He's even more unsettling than usual. Maybe those voices in his head aren't imaginary after all! Visit the Exile Leader in the Dread Plains to being the new Hundred-Year Curse mission chain (crafted with great skill by Silver Sky Magician). He will direct you to investigate something foul in the Mines. While there, you'll meet trusted Exile officer Alexis. He's been conducting recon operations in the Mines, but he may have been there a bit too long. 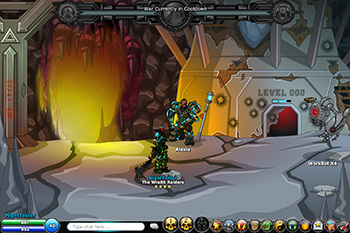 Try to gain Snork's trust to uncover more information about the disturbances in the Mines. Dig deep enough, and you may find something you wish you hadn't. Hmmm...nothing here? Or perhaps whatever lives there doesn't want to be seen just yet. Completing all 27 new missions will earn you piles of credits, 4 new achievements, and the chance to learn once and for all what Snork's deal is. Serious. Why is he so creepy? When you're not occupied by battling unholy terrors from the depths of Delta V, stop by Nightwraith's hangout in the Wasteland for his returning rares! "For several weeks, across our games, the dark council has been tricking you and your fellow players into gathering artifacts from our greatest villains. Why? They used the parts to create a new villain- Vaxen! A warlord powerful enough to conquer entire universes. First… his army is coming for all of ours!" 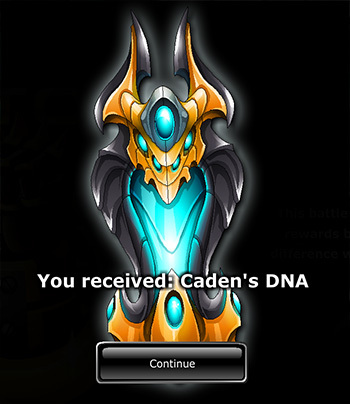 If you haven't yet done your part in EpicDuel and retrieved Caden's DNA, what are you waiting for? The 2016 Calendar is Coming! We are building this years new Calendar! Thyton was painting at the lab into the wee hours of the night... so I took a picture of what he is working on with my cell phone. YUP! A repainting of the classic DragonFable login screen focing on the DoomKnight Sepulchure! This year's calendar features paintings of favorite characters (Sepeulchure, Gravelyn, Galanoth, Artix), and never before seen NEW CHARACTERS that will be appearing next year in our games! Here is a preview of the cover. Dage also contributed several of his personal works for this calendar... making it an incredible collector's piece. We really raised the bar on this one... it is best described as 12 limited edition prints combined into one epic 12 page, full size, painted calendar. Yes, like our previous calendars it will include in-game items. More on that coming soon. The Artix Entertainment 2016 Calendar will go on sale at www.HeroMart.com at the end of this month. 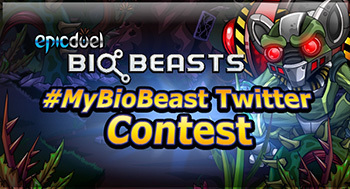 The winners of the #myBioBeast Twitter Contest have officially been announced on the BioBeasts developer blog! Congratulations to the winners and thank you for all who participated! 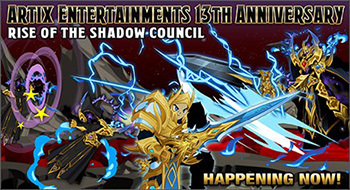 Today, get ready for the launch of EpicDuel's phase of Artix Entertainment's 13th Anniversary! The Mysterious Loremaster of the Council of Loremasters has arrived on Delta V. How did he get there and, more importantly, what does he want? He's seeking something of great interest to the Council and reward you handsomely for your trouble. If you succeed, you receive a new ultra-rare achievement! It's ultra-rare because you'll only be able to complete the mission for a limited time! 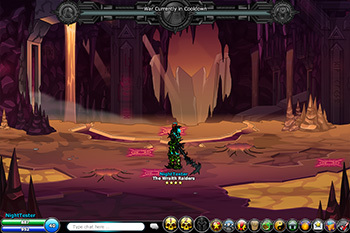 Be sure to complete all the event in ALL the participating Artix Entertainment games. The special event items in each game will become an awesome, exclusive weapon of great rarity! Remember, you'll need to participate in the events in all the AE games for maximum rewards!